The most intriguing player in this trade is, without question, Randolph, a 6-10 athletic freak who often found himself, along with 75 percent of his Golden State teammates, in coach Don Nelson's dog house. A power forward entering only his third full season in the league, the 20-year-old Randolph gives the Knicks a ton of options. With Amar'e most likely holding down the power forward position, Randolph will probably serve as his back up, but could find some burn alongside Amar'e and Gallo in the front court when D'Antoni elects to go "small," a relative phrase since the trio all come in around 6-10. (The 6-8 Wilson Chandler at the 4, from time to time, is also appealing, but I digress.) Here's a clip of Randolph in action. Azubuike and Turiaf add some much needed depth to the Knicks roster, and will also most likely come off the bench. Both can play, particularly on the defensive end. Of the two, Azubuike brings the most to the table, although we're talking mashed potatoes or stuffing, not the whole turkey. 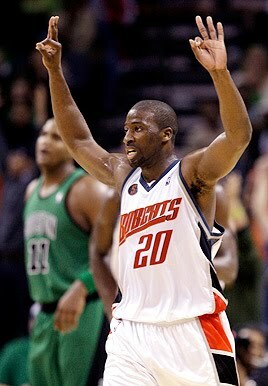 Next, the Knicks signed Raymond Felton to play the point. While he's not the most exciting or consistent point guard in the league, he is a facilitator and, by almost all accounts, the type of player who will do anything to help the team win. In today's Times, Dan D'Antoni, Mike's brother and Felton's former AAU coach, speaks the world of him. Felton's a definite upgrade over Chris Duhon, in almost every facet of the game. At the very least, his two-year contract is team friendly. Finally, in a move that surprised everyone, the Knicks signed Timofey "Timmy!" Mozgov, a 7-1 Russian center, to either mess with Nets owner Mikhail Prokhorov or break LeBron James' kneecaps. Either way, I endorse the move. 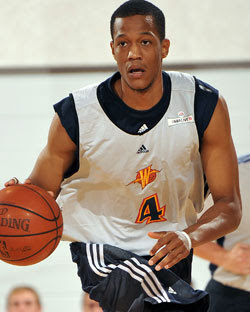 I spent most of yesterday morning, when news of his signing started leaking out, checking out YouTube clips of Mozgov. Long and pretty athletic. Good for the pick and roll, too, and high screens, staples of D'Antoni's offense. Can block some shots, to boot, something desperately missing from the Knicks' arsenal in recent years. DraftExpress' Timothy Givony says Mozgov is one of the top two international free agents, comparing him to a bulkier Andris Biedrins or a Russian D.J. Mbenga. Not exactly a game changer, but certainly good enough for 10-15 minutes per game, maybe more. With Mozgov, Turiaf and, last time I say this, I swear, Eddy Curry in the fold, the Knicks have enough bodies to man the center position every night. The best thing about these recent moves is none prevent the organization from making moves going forward. The roster, once a warehouse of untradeable contracts and mediocre talent, is now balanced, athletic, and full of promise. (Only Amar'e, Gallo, Toney Douglas, and Randolph are even contractually linked to the Knicks beyond the 2011 season.) Sure, the roster would have been even more exciting if LeBron had come aboard, but as far as Plan Bs go, this one ain't so bad. A friend of mine put it nicely: "I've been rooting for the Knicks for years," he said. "This is the first team in the past 10 years I actually like."